The Eight Realizations of a Bodhisattva Sutra allows us to see the world as a bodhisattva does: complete with its share of difficulties and troubles, but also equip with endless opportunities to become wiser and more compassionate. The Great Realizations is a new English translation and commentary that weaves the teachings of this essential sutra into the larger Buddhist tradition. With teachings on how to find contentment, the importance of diligence, and the benefits of generosity, The Great Realizations is an ideal starting point for those interested in Buddhism, as well as a faithful companion for those committed to Buddhist practice. Abasic teaching of the Buddha is that all things are caused and that nothing comes into being without a reason. This way of thinking is so fundamental to Buddhism that all Buddhist sutras begin with an explanation of the causes that led to their inceptions. There is only one exception to this rule-The Eight Realizations of a Bodhisattva Sutra. This sutra does not have an introductory section that states where the sutra was spoken, to whom it was spoken, and who was responsible for remembering it. The introductory part of this sutra may have been omitted when it was translated into Chinese near the end of the second century of the common era. 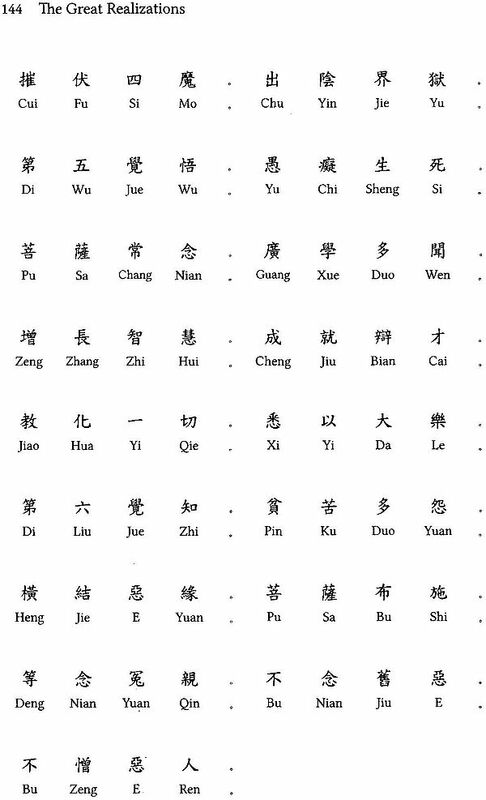 The Eight Realizations of a Bodhisattva Sutra is one of the first Buddhist sutras ever translated into Chinese. It reads like a short summary of Mahayana Buddhism, and surely it was selected for early translation for precisely this reason. It is characterized by its brevity, clarity, and completeness. 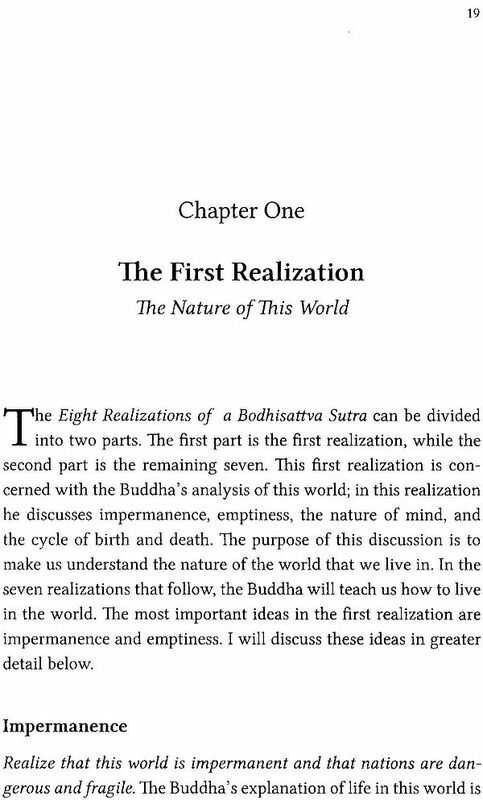 The Eight Realizations of a Bodhisattva Sutra is a mature compendium of the main ideas of Mahayana Buddhism. Its early translation into Chinese was clearly an attempt to introduce Buddhism to an intelligent and receptive non-Buddhist Chinese audience. 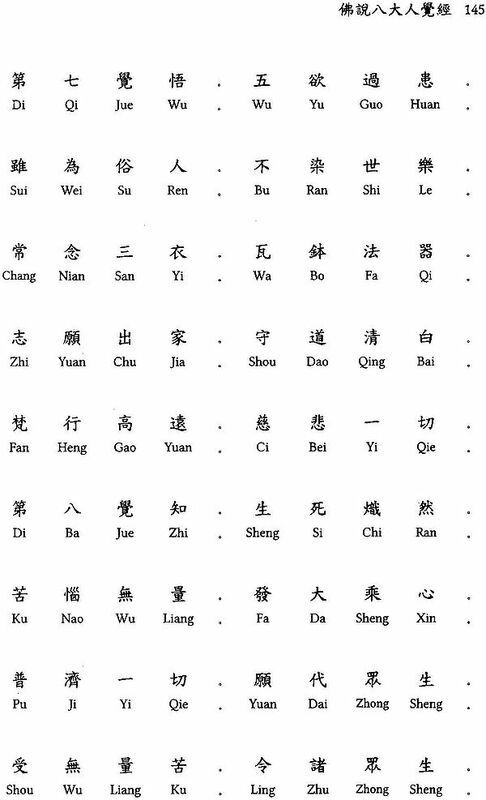 This sutra, along with the Sutra in Forty-two Sections, which is the first sutra ever translated into Chinese, and which is also a brief work, prepared China for the vastly detailed Buddhist literature that was to pour into it over the next five centuries. The eight realizations discussed in this sutra are also mentioned in the Agama Sutras, the Sutra of Teachings Bequeathed by the Buddha, and the Satyasiddhi Sastra. 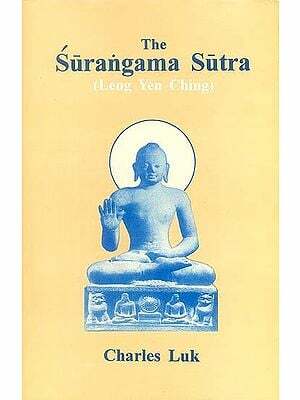 The original Sanskrit version of the sutra has been lost. "Oh Buddha, those of us who are monks know that our behavior must be guided by the Six Points of Reverent Harmony, and that we must be selfless with each other. We also know that we must treat all other sentient beings with compassion and kindness. Oh Buddha, how are lay people to behave? And how are those of us who are monks to behave when we interact with lay people? Please tell us how they are to become enlightened and how they should behave if they want to achieve nirvana"
The Buddha replied, "Aniruddha, you have asked a good question. This question pertains to the realizations of all bodhisattvas. I will now explain to you that which, night and day, you should hold in your mind…"
The Eight Realizations of a Bodhisattva Sutra has been praised by Buddhist masters down through the centuries. Its greatness lies in its emphasis on the importance of life in this world. Though it is a short text, it is infinitely valuable for it shows how the Buddha intended his teachings to be used. This sutra is like a compass and navigational chart. It offers all of the wisdom we will ever need to steer our lives away from confusion and fear toward the peace and security of the shores of truth. Sakyamuni Buddha, who is the speaker of this sutra, was born a prince in Kapilavastu in what is now Nepal. At the age of twenty-nine, he renounced all of his worldly privileges to pursue the truth. After six years of practice, he became enlightened one evening while meditating under a bodhi tree. For the next forty-five years, he taught others how to realize what he had seen. The giving and compassion that he displayed in teaching the Dharma for so many years form a living core around which all of the rest of Buddhism clusters. Though the teachings of the Buddha contain many philosophical ideas, they must never lead us into believing that they have no application to life or that we should turn our backs on others because of them. 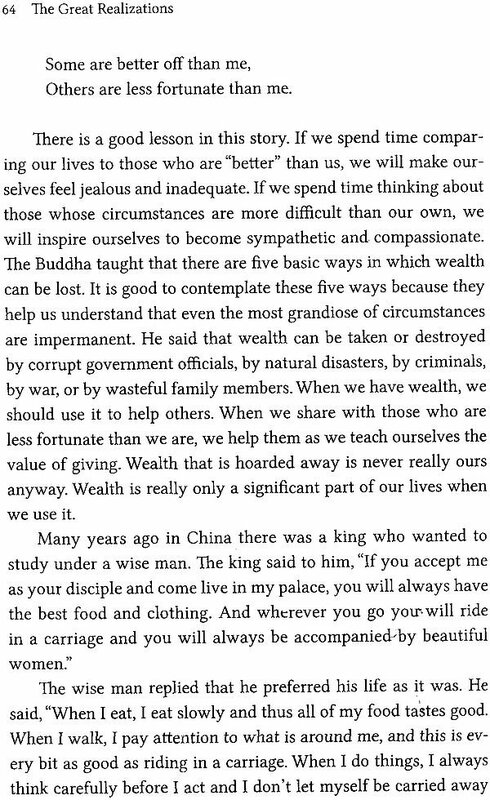 The compassionate example of Sakyamuni Buddha stands as a constant reminder that the well being of others is fully as important as our own. The word Buddha means "enlightened one" or "awakened one." Sakyamuni Buddha is the Buddha of our realm. He is usually referred to as "the Buddha." There are many other Buddhas residing in many other realms it the universe. The Buddha taught that there are more Buddha realms in the universe than there are grains of sand in the Ganges River. Just as the night sky teems with stars, so the universe is teeming with life. 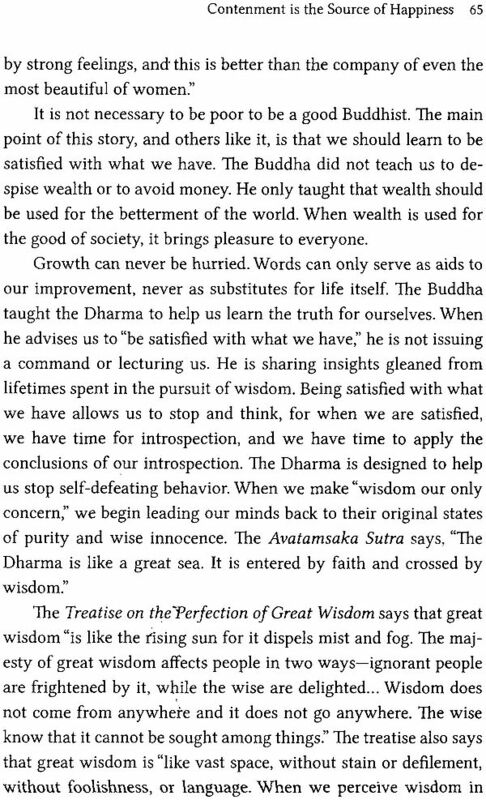 Sakyamuni Buddha did not invent the truths that he taught. He discovered them. He taught that all human beings can do what he did. He said that when a human being makes his consciousness perfectly pure, he will see the truth that underlies all things. In that moment he will become enlightened. As we delve more deeply into the Eight Realizations of a Bodhisattva Sutra, we will learn much more about the truths that the Buddha taught. His teachings are often described as a "path" because they lead us toward discovering the truth for ourselves. The truths of Buddhism are living truths and they cannot be handed to us by anyone. They must be discovered and experienced by each and every one of us. The purpose of the Dharma is to teach us how to see for ourselves. The word bodhisattva is a compound of two Sanskrit words bodhi and sattva. Bodhi, which means "enlightened," is derived from the same word that gives us Buddha. Sattva means "sentient being." A sentient being is any being with consciousness or the potential to become conscious. Animals and insects are sentient beings, while plants are not. A bodhisattva is a person who dedicates his life to the enlightenment of all other sentient beings in the universe. Sometimes this word is translated as "enlightening being" because bodhisattvas are dedicated to the "enlightening" of all other sentient beings. Some bodhisattvas are exceptionally great beings who can manifest at will for the good of others. Other bodhisattvas are merely ordinary people who have made the extraordinary vow to dedicate themselves to the well being of others. The Eight Realizations of a Bodhisattva Sutra is directed mainly at ordinary bodhisattvas. It is intended to teach them how to behave in the world, and how to help others. It teaches that the life of a bodhisattva must be characterized by compassion, caring, wisdom, and kindness. In this sutra, as well as in many others, the Buddha explains that the bodhisattva path is an active path that leads into life and that it is not a passive way that seeks only to retreat from life. Buddhism is an eminently practical religion because it teaches us how to live in this world. It is also the most mystical of religions because it shows us how to experience transcendental awareness in every moment of our lives. The Buddha is sometimes called the "great doctor" because he shows us how to cure ourselves of the ills of ignorance. He is sometimes called the "great teacher" be-cause he teaches us how to free ourselves from the greed and anger that bind us to the world. He is sometimes called the" great ox" be-cause he uses his strength to draw us toward the truth. In the Eight Realizations of a a Bodhisattva Sutra, the Buddha summarizes the principal points of his teaching. 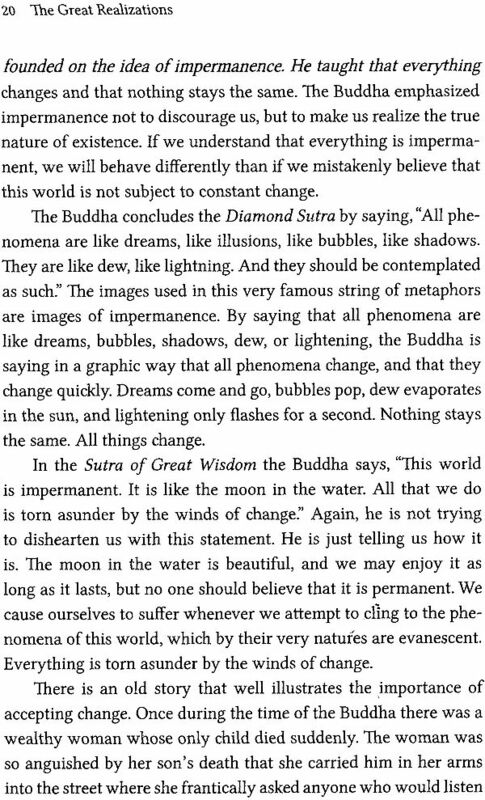 As its introductory verse says, this sutra ideally should be "held in the mind, and chanted often, both night and day."